To say that blends are out of style (at least for drip and French press brewing) in the contemporary high-end world of specialty coffee would be an understatement. Today one seldom sees blends intended for drip brewing featured by cafes and roasting companies with serious upscale coffee aspirations. And any drip blend that does show up is lost among the exotic crowds of direct-trade, micro-lot, farm-to-cup single-origin coffees with their precise and lengthy names and engaging stories. But the art of blending for brewed coffee is still being practiced at the upper end of the industry, and may even be undergoing a modest revival. How good and how interesting are contemporary drip blends offered by elite roasting companies? For this article we tested well over forty blends from thirty-one roasting companies. We focused our attention on blends consisting of a minimum of three different coffees. It turned out that our three-coffee-minimum stipulation definitely limited the pool of candidate blends, since many roasters’ only blends consist of those assembled from two coffees (“two-bean blends” in industry jargon), perhaps because limiting a blend to two coffees allows roasters to more easily invoke the direct-trade marketing appeal by allowing a close focus on the specific sensory identities and stories associated with those two coffees. We felt, however, that the art of blending arguably is best realized when the blender introduces sensory influences from multiple green coffees rather than working with the contributions of only two. Although, as it turned out, we did appear to miss out on some potentially fine coffee experiences owing to our three-or-more rule. But we will compensate by putting a two-bean-blend survey on our calendar for 2015. Blends continue to be of prime importance in the world of espresso, of course, despite a growing focus on espressos from a single origin. The generally sensation-intensifying impact of the espresso brewing method assures the continuing importance of blends in which multiple coffees can be deployed to both round and soften over-assertive acidity while compensating by promoting fatter mouthfeel and a low-toned, layered complexity. The continuing importance of blends in espresso may be one reason why, out of the forty-plus blends nominated by roasters for this article, ten were primarily designed for espresso. In many cases, roasting companies may have nominated an espresso blend simply because they had no drip blends on their menus. Drip blends are out of style, I think, for several reasons. First, they do not promote the sort of attention to producers and the field-to-cup drama that can be communicated around fine single-origin coffees. Second, the best single-origin coffees produced today are so exceptional and extraordinary that it seems like coffee blasphemy to mute their distinction by combining them with other coffees. Finally, blending is a practice that has come to be associated with a whole array of poor-quality coffee products ranging from rotten-Robusta-ridden canned blends to the thin-bodied, bitter, they-all-taste-the-same “French roast” blends that dominated specialty coffee’s dark ages fifteen or so years ago. No wonder newer roasters avoid blends. Finally, there are practical reasons for roasters to bypass blends. Blends, particularly blends containing three or more coffees, are difficult to formulate in the first place and even harder to maintain consistently, given that constituent coffees may change character season to season and even month to month as they age and fade. Why Blend in the First Place? Given all of that, why should a specialty coffee company offer drip blends at all? One reason is business-driven. A roasting company that can establish a taste for and loyalty to a proprietary blend has developed an important business asset that has the potential to grow in value over the years. Other business-driven reasons are more dubious: blends may be a way of getting rid of fading coffees by working them in with fresher coffees, or cutting corners by brightening up cheap coffees with smaller volumes of more vivacious (and more expensive) coffees. Or, more honorably, a blend may simply be a way of producing a solid, consistent, middle-of-the-road coffee aimed at pleasing everyone and offending no one that will work well in food-service environments where only one or two coffee options can be offered. The most interesting reason to blend, however, is the challenge and excitement of creating a new composite sensory experience different from any sensory experience obtainable from a single coffee, even a very fine single coffee. This seemed to be the main goal of the best of the blends we sampled for this month’s article, eleven of which are reviewed here with ratings ranging from 93 to 91. However, the fact that even the finest of this month’s blends did not pop to 94 or higher gives some support to the idea that blends, with their tendency to substitute balance and completeness for individuality, cannot quite duplicate the shock and excitement of a really fine, genuinely distinctive single-origin coffee. To use a very rough analogy, three or four fine voices singing together may not quite reach the expressive heights of a single great solo voice. But the fascination for me with the best of this month’s blends is how they not only achieved excellent balance, which one would expect from a good blend, but also managed to create subtly original aromatic profiles with very wide sensory referencing, wider perhaps than achieved by even highly distinguished single-origin coffees. The two highest-rated of this month’s blends, the Blue Bottle Three Africans and the Taiwanese roaster Café Est‘s Est Drip Blend, both rated 93, appeared to follow the basic principal of the world’s oldest blend, the ancient Mocha-Java formula: juxtapose a sweet, fruity “natural” or dried-in-the-fruit coffee with a brighter, more acidy wet-processed coffee. 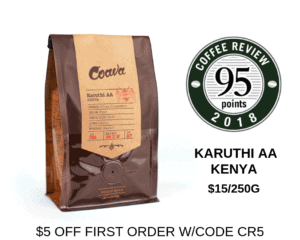 Both of these blends complicated the basic Mocha-Java-style formula by adding a third, quieter coffee, presumably to round and perhaps deepen the impact of the two more assertive lead coffees. The Taiwanese Bacca Café’s Dream Blend and the Korean Namusairo Coffee’s Rite of Spring, both rated 92, followed the Mocha-Java principal as well, but doubled down on the bright side of the formula by adding a Kenya to a wet-processed Ethiopia as contrast to the sweeter and rounder dried-in-the-fruit component. Finally, the designed-for-espresso blends. We put these on the cupping table mixed in with the for-drip blends and some showed surprisingly well there. They did not offer quite the same pleasures as the generally brighter, livelier drip blends; they often were a bit muted in their acidity, though they tended to compensate with smooth mouthfeel and chocolaty sweetness. We review three here, the award-winning Ganesha Espresso from Tony’s Coffees (92), the Gingerbread Seasonal Espresso from Taiwan’s Donkey Café (91), and the Gamut Espresso from Chromatic Coffee (91). The latter two blends were light-roasted and pleasingly delicate in their honey and chocolate expression. The medium-roasted Ganesha was another matter: big-bodied, resonant, oaky, with deeply sweet, almost carnal floral notes. At least one of the components of the Ganesha betrayed a very slight hint of musty ferment, a note that can bestow depth and resonance in espresso brewing, as it did when we assigned a 94 to the this blend when we tested it as espresso this past November. I found this ambiguous note also worked well this time around on the cupping table, although my tasting partner Jason Sarley disagreed and found it too prominent and distracting in a cupping format. I’m the boss, however, so my higher rating prevailed, although coffee lovers who enjoy only clean sparkle in their drip coffees should be forewarned on this one. 2014 The Coffee Review. All rights reserved.